↑ "Prize Money – All-time, Professional". CueTracker – Snooker Database. สืบค้นเมื่อ 3 May 2016. ↑ "Centuries". สืบค้นเมื่อ 4 July 2016. 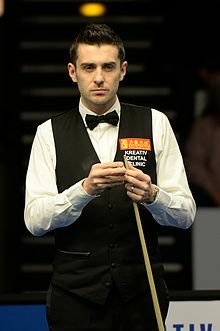 ↑ "Mark Selby - Season 1998/1999". Cuetracker. สืบค้นเมื่อ 15 June 2014. ↑ "Higgins beats brave Selby in epic". BBC Sport. 8 May 2007. สืบค้นเมื่อ 8 May 2007. ↑ Ashdown, John (18 April 2008). "Small talk: Mark Selby". The Guardian. London. สืบค้นเมื่อ 17 January 2010. Well, I just seem to make people laugh. I used to have a laugh and a joke with the compere, Richard Beare, and he gave me the nickname the Jester from Leicester. หน้านี้แก้ไขล่าสุดเมื่อวันที่ 2 พฤษภาคม 2560 เวลา 10:27 น.